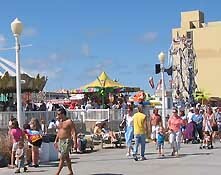 The Neptune Festival Boardwalk Weekend is located on the Virginia Beach boardwalk between 1st and 30th Streets. It takes place the last weekend in September. Free admission. Virginia Beach sends off summer with a bang. The month-long Neptune Festival culminates in the fabulous Boardwalk Weekend featuring the North American Sand sculpting Championship, numerous sporting events, fireworks, food, an open-air art show along the Boardwalk, an air show and the Neptune Parade. Ranked among the top 10 festivals in the Southeast by the Southeast Tourism Association, the Festival is also one of the American Bus Association's top 100 festivals in the country. Find an oceanfront hotel for the Neptune Festival. 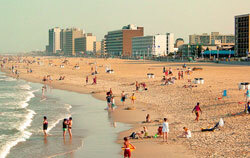 We arrived at the Virginia Beach oceanfront at about noon on Sunday. The area was mobbed but we lucked into a parking spot right on Atlantic Avenue. Perfect warm and sunny weather brought out the crowds. September and October are probably the best weather months here ... the oppressive summer humidity is gone and sunshine is nearly constant (except when the remains of a hurricane pass through). Volleyball nets covered the beach south of 5th Street. Numerous two-person teams battled in friendly competition. Heading north on the boardwalk, we came to the sand castle competition. The big and beautiful sand sculptures wow the crowds every year. This has become a signature event for the festival ... look at my photos to see why. 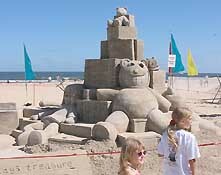 Here's another gallery of sand sculpture photos. Continuing north, we came to one of the bandstands and the surfing competition. The band may not have been good, but it sure was loud! Music is not the Neptune Festival's strong point. 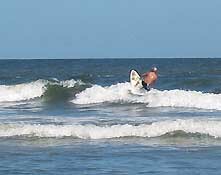 Kids on boogie-boards were doing their thing in the surf. Carnival rides filled a lot at the boardwalk. To the north was the huge boardwalk art festival. The excellent quality work is fun to see and buy. 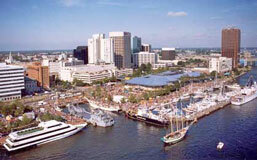 The official Virginia Beach Neptune Festival website has all the details. 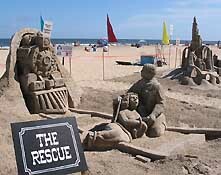 The sand castle contest at the Virginia Beach Neptune Festival is a real crowd pleaser. Some of the wonderful sand castles in the contest. Virginia Beach Neptune Festival surfing contest.